Stitchin' Bints: spinning fine yarn - when to stop?! 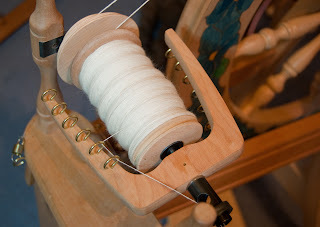 I've been spinning for Twinkle most days and the first bobbin is looking pretty full now. I'm sure that if necessary I could pack the rest of the first 100g onto that bobbin before it started to foul the flyer. b. I don't want to spin 200g if I only need just over half that. I notice that two skeins will also make the next two sizes up and the next size down only needs one skein. So I'm assuming my size only needs one of the 800m skeins plus a bit of the second. Running out of yarn isn't usually a problem with a spin / knit project because you just spin some more (it's not such good practice but I sometimes spin a bit, knit a bit, spin a bit etc). But here I'm going to dye these skeins of wool and so I really have to dye all the yarn I'm going to use in one go. The second and nicer thing is that as you become more and more confident about drafting very fine singles, you find the wheel going faster and faster. (The finer the singles, the more twist they eat up). Initially this means switching to the fastest ratio, and after that, working the right leg faster and faster. To save my knee giving out prematurely I've treated my wheel to some high speed kit. Having converted it to double-drive, this means a small high speed whorl. 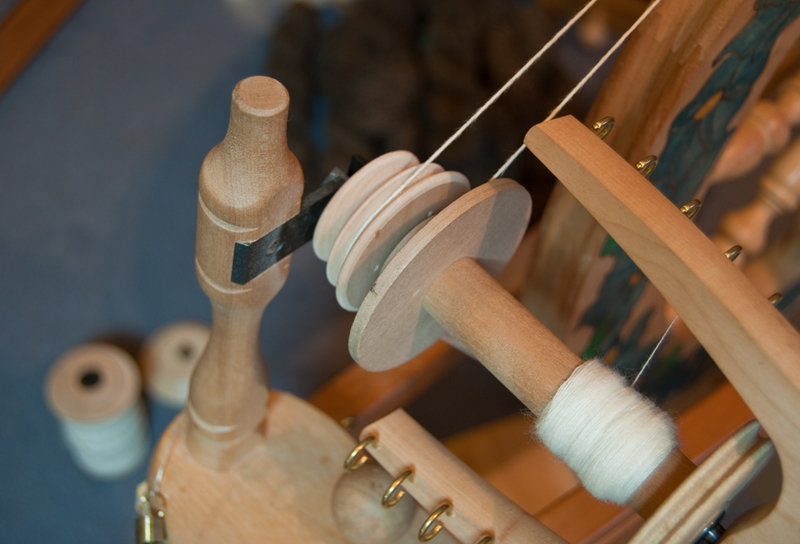 Also special high-speed bobbins with a smaller whorl. 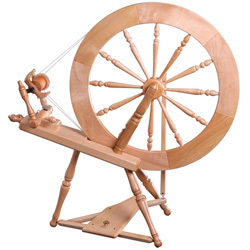 The latter is important because for double-drive to work properly, the whorl on the bobbin needs to be a different size to the whorl you're using on the flyer. Now it's whizzing along and I'm back to the more usual steady treadling speed! why not spin and dye the full amount, knit the cardi, work out the remainder and overdye it to a dark purple or similar then it will be there for when you want to knit a lacy shawl.